Analysis: Prior to his departure, Williams racked up 10 carries for 70 yards and one touchdown while hauling in two of his three targets for 16 yards. With Aaron Jones (knee) on IR, Kapri Bibbs and Lavon Coleman are the sole health running backs on the active roster. Analysis: Williams upgraded to full participation Friday after logging limited practice sessions Wednesday and Thursday. He appears to be locked in for heavy usage, with recently signed Kapri Bibbs the only other running back on Green Bay's 53-man roster in the wake of Aaron Jones' season-ending knee injury. Williams handled an 87 percent snap share in last week's 24-17 loss to Chicago, taking 12 carries for 55 yards and a touchdown while adding four catches for 42 yards on five targets. Analysis: For the second straight session, Williams' workload was capped as he tends to a toe injury. He's expected to fill in as the Packers' lead back with Aaron Jones (knee) on injured reserve, but owners may have to wait until Friday to get some clarification on his availability for Sunday's road game against the Jets. The only other running back on the 53-man roster is Kapri Bibbs. Williams was limited at Wednesday's practice due to a toe injury, Michael Cohen of The Athletic reports. Analysis: In the wake of Aaron Jones (knee) landing on injured reserve, Williams is left as the Packers' top running back, but an injury of his own is impacting his practice reps to begin Week 16 preparations. Assuming Williams maintains that workload (at worst) or elevates to full participation, he should handle the majority of the work out of the backfield Sunday against the Jets. His sole competition for touches is Kapri Bibbs, who was claimed off waivers Monday. With Aaron Jones (knee) landing on injured reserve, Williams will presumably serve as the lead back in Weeks 16 and 17. Analysis: Williams performed well in relief of Jones during Sunday's game against the Bears, running 12 times for 55 yards and a touchdown. His downhill running style juxtaposes with Jones' speed and elusiveness, but Williams is the team's best pass protector and a capable runner in his own right. Kapri Bibbs will slot in as Williams' change-of-pace option out of the backfield, and the Packers could even elect to add a third option before Sunday. Williams rushed for 55 yards and a touchdown on 12 carries and added 42 yards on four catches during Sunday's 24-17 loss to Chicago. Teammate Aaron Jones sprained his knee during the contest, Ian Rapoport of NFL Network reports. Williams had four carries for 17 yards in Sunday's victory over the Falcons. Williams had seven carries for 13 yards and four receptions for 14 yards in Sunday's loss to the Cardinals. He also returned three kicks for 72 yards in the game. Williams had one carry for five yards in Sunday's 24-17 loss to the Vikings. Analysis: It was another quiet week for Williams, who was on the field for just 13 offensive snaps. Meanwhile, Aaron Jones played 40 snaps and had another productive outing (17 carries for 72 yards and a touchdown), so don't expect much to change with the Packers' backfield situation in Week 13 against the Cardinals. Williams had one carry for five yards in Thursday's 27-24 loss to the Seahawks. 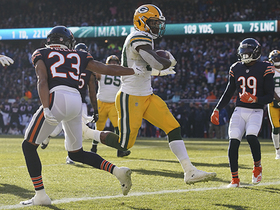 Analysis: Fellow running back Aaron Jones had already taken over as the primary running back prior to Week 11 and also handled the bulk of the work on passing downs Thursday, rendering Williams almost a non-factor. The gap between the two has widened significantly the last couple weeks, and with Jones excelling on both the ground and through the air -- while proving at least competent at pass blocking -- don't expect that to change anytime soon. Williams had three carries for three yards in Sunday's victory over the Dolphins. 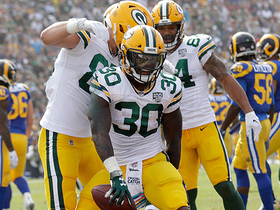 Analysis: Fellow running back Aaron Jones had his best game of the season Sunday, which resulted in Williams playing only a bit role. 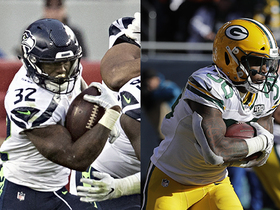 Jones has tallied 41 carries to Williams' 14 since the Packers' Week 7 bye, so it's clear who the man in the Packers backfield is these days. The two backs had been playing relatively even roles earlier in the season, but consider Jones the clear starter at this point, with Williams filling a complementary role. Williams had seven carries for 34 yards and two receptions for 20 yards in Sunday's loss to the Patriots. 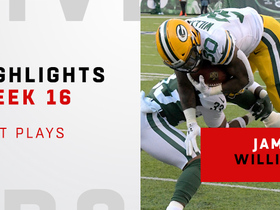 Analysis: Williams made the most of his touches and put up his most yards from scrimmage since Week 2, but his overall output still did not do much for fantasy players. The Packers used just two running backs Sunday following the trade of Ty Montgomery last week, but Williams worked as the clear No. 2 option behind Aaron Jones, who totaled 43 snaps to Williams' 31 and also clearly topped Williams in all of touches (16), carries (14) and yards from scrimmage (86). Williams had four carries for nine yards and a touchdown in Sunday's loss to the Rams. Williams had six carries for 29 yards and one reception for 10 yards in Monday's victory over the 49ers. Williams had six carries for 33 yards and two receptions for 19 yards in Sunday's loss to the Lions. Williams gained 27 yards on 11 carries and wasn't targeted in the passing game during Sunday's 22-0 win over Buffalo. 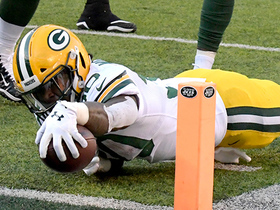 Analysis: Williams was vastly inferior to Aaron Jones on the ground, as Jones turned 11 carries into 65 yards and a touchdown. Based on how well Jones has played in two games since returning from suspension, he's likely to get more work at Williams' expense against the Lions in Week 5. 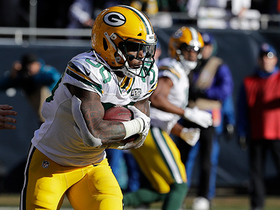 Williams rushed five times for 29 yards and brought in two of three targets for 16 yards in the Packers' 31-17 loss to the Redskins on Sunday. Williams and Ty Montgomery are expected to see the majority of the snaps out of the backfield Sunday against the Redskins after head coach Mike McCarthy said the duo "will be in the first slot" among the team's running backs this week, Rob Demovsky of ESPN.com reports. Williams carried 16 times for 59 yards and caught three of four targets for 12 additional yards during Sunday's 29-29 tie with the Vikings. Williams had 15 carries for 47 yards in Sunday's victory over the Bears. He was targeted twice but did not catch a pass. Williams (ankle) appears to be a full participant at Monday's practice, Tom Silverstein of the Milwaukee Journal Sentinel reports. Analysis: Williams only missed a few days of practice after hurting his ankle in the second week of the preseason, but the extent of his participation hasn't been clear. He never seemed too worried about the injury and should be fine for Week 1 against the Bears. Williams should be busy while Aaron Jones serves a two-game suspension, but Ty Montgomery (foot) also figures to have a role if he's healthy. Williams (ankle) was in pads at Tuesday's practice, Tom Silverstein of the Milwaukee Journal Sentinel reports. Coach Mike McCarthy said Williams (ankle) will be limited in practice this week, Rob Demovsky of ESPN.com reports. Analysis: Participation in any capacity would confirm that Williams escaped with a minor injury after exiting Thursday's preseason win over the Steelers. An appearance in Friday's exhibition against Oakland might be a lot to ask, but it at least seems Williams is on the right track to make it back before Week 1. Ty Montgomery could be busy with the first-team offense Friday, though the Packers are hopeful Aaron Jones (hamstring, suspension) also will be available. Williams is "fine" after suffering a "minor" ankle sprain Thursday against the Steelers, Tom Pelissero of NFL.com reports. Analysis: There's a strong possibility Williams misses practice in the aftermath of the contest, and at the very least, he'll be alongside Aaron Jones (hamstring) in the trainer's room in the short term. If the presumed diagnosis is accurate, Williams may be good to go by the Packers' third preseason game Friday, Aug. 24 at Oakland. On the other hand, the team may hold him out with the regular season in mind, which would leave the exhibition reps to Jones (if available) and Ty Montgomery. Williams doesn't think his ankle injury is a long-term concern, Rob Demovsky of ESPN.com reports. Williams injured his ankle in Thursday's preseason tilt against Pittsburgh. Analysis: Williams had just two carries for two yards before exiting with his ankle injury. It's unclear how severe the issue is, but the team isn't likely to risk making it worse in a preseason game. Look for Joel Bouagnon and Akeem Judd to get some extra snaps with Williams sidelined for the time being. Williams had five carries for 16 yards and one reception for eight yards and a touchdown in Thursday's preseason opener. Analysis: Williams did not get much going on the ground Thursday, but his touchdown was impressive, as he caught the ball in the flat, made his defender miss on the sideline, and dove in for the score from a couple yards out. As long as he stays healthy, everything is lined up for Williams to open the season as the Packers' starting running back. Williams has been getting most of the work with the starting offense during normal down-and-distance situations, Rob Demovsky of ESPN.com reports. Packers coach Mike McCarthy expects Williams to be part of a committee backfield, ESPN.com's Rob Demovsky reports. "We've got young players that we really like that all played really well, but it's been in short periods of time," McCarthy said. "Ty Montgomery had a run there where he was outstanding. Jamaal has probably been the most available of the three, and Aaron [Jones] has been so impactful when he's been in there." Williams recorded 22 carries for 82 yards and three catches (on five targets) for 31 yards during Sunday's 35-11 loss at Detroit. 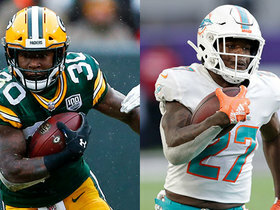 Williams is expected to handle the bulk of the snaps at running back Week 17 against the Lions with Aaron Jones (knee) considered unlikely to play, Rob Demovsky of ESPN.com reports. Williams recorded 15 carries for 58 yards and didn't reel in any of his three targets during Saturday's 16-0 defeat to the Vikings. Williams rushed 10 times for 30 yards in Sunday's 31-24 loss to the Panthers. Williams took 15 carries for 49 yards and a touchdown and caught all seven of his targets for 69 yards and another score in Sunday's 27-21 overtime win in Cleveland. Williams rushed 21 times for 113 yards and a touchdowns and brought in two of three targets for 10 yards in Sunday's 26-20 overtime win against the Buccaneers. 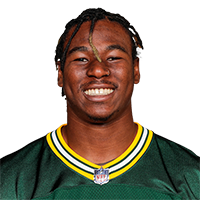 Williams is expected to act as the Packers' lead back Sunday against the Buccaneers even though Aaron Jones (knee), who is listed as questionable for the game, is likely to play, Adam Schefter of ESPN reports. Williams could face competition for the lead-back role Sunday against the Buccaneers with teammate Aaron Jones (knee) listed as questionable for the contest, Tom Silverstein of the Milwaukee Journal Sentinel reports. Running backs coach Ben Sirmans said Thursday that Williams "deserves" snaps, even when Aaron Jones (knee) is healthy enough to return, Ryan Wood of the Green Bay Press-Gazette reports. Williams' teammate Aaron Jones (knee) returned to practice Wednesday as a limited participant, potentially providing competition for snaps and touches in Sunday's game against the Buccaneers, ESPN.com's Rob Demovsky reports. Williams carried 21 times for 66 yards and a touchdown while catching four of five targets for 69 yards and another touchdown during Sunday's 31-28 loss to the Steelers. Williams carried 18 times for 57 yards and caught four of six targets for an additional 38 yards during Sunday's 23-0 loss to the Ravens. Williams is expected to lead the Green Bay rushing attack Sunday against the Ravens, Michael Cohen of the Milwaukee Journal Sentinel reports. 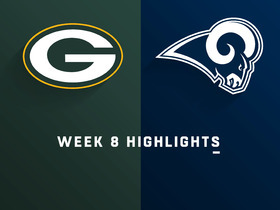 Williams could be in store for a sizable workload Sunday against the Ravens with Aaron Jones (knee) set to miss the next 3-to-6 weeks and Ty Montgomery (ribs) uncertain to play Week 11, Rob Demovsky of ESPN.com reports. Williams rushed for 67 yards on 20 carries and added a seven-yard catch during Sunday's 23-16 win over the Bears. Williams had one carry for one yard and a touchdown and two receptions for 31 yards in Monday's loss to the Lions. 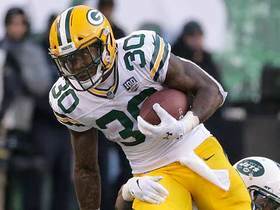 Watch the best plays from Green Bay Packers running back Jamaal Williams Week 16 when he faced the New York Jets. Green Bay Packers quarterback Aaron Rodgers tosses a short pass to running back Jamaal Williams who picks up 26 yards. 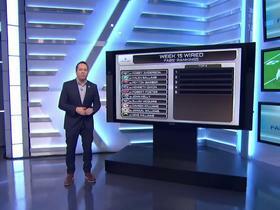 NFL Network's Fantasy expert Michael Fabiano recommends his starts and sits for Week 16.